Eaton Quicklag® Type BAB 2-Pole industrial miniature circuit breaker with shunt trip, is rated at 20-Amps and 120/240-Volt AC. Interrupt rating of this circuit breaker is 10-Kilo-Amps at 120/240-Volt AC. Shunt trip of this circuit breaker, requires one extra pole space on right side and draws 2.6-Amps at 120-Volts/11-Amps at 24-Volt DC. It measures 1-Inch x 2.38-Inch x 2.94-Inch. This 1-Phase circuit breaker with extended tang line terminal connection, accommodates copper/aluminum conductor of size 14 - 4-AWG. 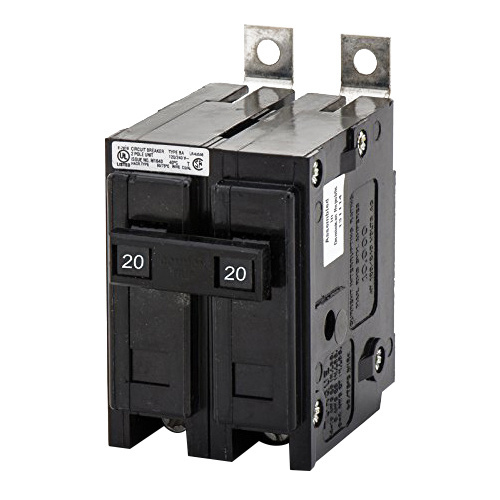 HACR rated circuit breaker features thermal-magnetic trip function to ensure reliability. Bolt-on mounting circuit breaker is perfect for use on panelboards. Industrial miniature circuit breaker is UL listed, CSA certified and meets Federal Specifications.